Recently, my colleagues and I visited several occupational health (OH) departments across England to talk about the ongoing risks to healthcare workers of exposure to bloodborne viruses. 4,830 healthcare workers have reportedly been exposed to bloodborne viruses between 2004 and 2013, and the annual number of reported exposures has risen from 373 in 2004 to 496 in 2013. In true scientist fashion, we went armed with countless evidence documents full of epidemiological information to demonstrate our point. We had good reason to advise caution. The recently published Public Health England report Hepatitis C in the UK informs us that over 200,000 people are infected with chronic hepatitis C (HCV), while the recently published ‘eye of the needle 2014’ report advises us that 50% of healthcare workers exposed to a bloodborne virus, were exposed to HCV. 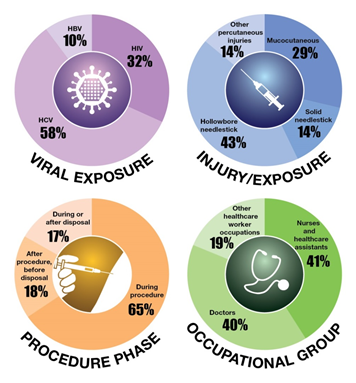 Taken together, these facts make a compelling case for the importance of preventing injuries in healthcare settings and reducing the risk of exposure to bloodborne viruses, including HCV. The infographic below highlights key findings from the eye of the needle. But knowing these facts can only take us so far in protecting healthcare workers. Our visits to OH departments served as an important reminder that epidemiology and surveillance data are, although fundamental, just one part of a wider public health and OH agenda. When we arrived at the reporting sites we visited, the first thing that struck us was the wide variation in practical arrangements for OH provision. While some OH departments appeared to sit comfortably at the heart of the hospital site, others were located separately from the rest of the hospital and in temporary buildings. The wealth of information displayed in waiting rooms showed the diversity and importance of the work of OH departments. Posters on walls ranged from stress-busting tips to world maps detailing the vaccinations required for healthcare workers travelling abroad. It dawned on us that contributing to the national surveillance of significant occupational exposures to bloodborne viruses is but one of many important duties on the list of OH departments. Although we did hear comments such as “needlestick injuries happen all the time,” in our chats with OH practitioners, we were reassured that the consensus among OH practitioners is that they care very much about needlestick injuries and the safety of their staff. And we have to agree. We do need to make reporting easier for our dedicated reporting sites. Reducing the burden of reporting is a high priority for the Significant Occupational Exposures (Sig. Occ) team in 2015. Next year, we will aim to enhance the frequency and quality of data reported to the surveillance system and produce even higher quality outputs. It goes without saying that the data we are able to present in our key outputs, such as the eye of the needle report is directly linked to the data submitted to the Sig. Occ. surveillance system. From what we gather, many clinics are already collecting the same surveillance data for their own purposes and are presenting this to their own trust board of directors to inform local strategies, procurement, and policies. In addition to local approaches, the prioritisation of OH at the national level can have a real impact on reducing injuries and improving reporting. We owe this to individual healthcare workers and to the wider population. Because public health matters, efforts that maximise health, wellbeing and infection control must continue to be extended to our healthcare workers. The facts are simple. Healthcare workers should not sustain injuries at work that expose them to bloodborne viruses. Devices are available which are specifically designed to prevent injuries and policies such as the EU Directive 2010 already stipulate the importance of providing safer working conditions. All that remains is for this guidance to be put into practice in a meaningful and measurable way, accompanied by rapid action and assessment as stated in this article about occupationally acquired acute Hep C.
Nonetheless, we take a participatory approach to improving surveillance for the benefit of patients, healthcare workers and the wider population. We are keen to hear from our reporting sites with their ideas about how we can make reporting easier. Please do contact us with your suggestions. UK Ebola case: What does this mean for people in the UK? Thanks for the great blog and a topic that does not always feature, but is important none the less. I think the key, as you have laid it out, is around making it easy for people to report. I also like the fact that some have this in their reporting to the board too. Thanks for the positive feedback Bren. We suppose the next stage is to collate and review suggestions from Trusts on exactly how to make reporting easier for our sites. We are very open to receiving feedback and ideas.